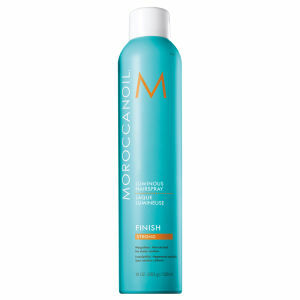 Moroccanoil Luminous Hair Spray has a weightless, non-sticky texture and provides a long-lasting, flexible hold. Infused with argan oil, Moroccanoil's signature ingredient, the vitamin and antioxidant rich formula nourishes hair and helps to maintain soft, natural styles. Argan oil also helps to combat the effects of UV damage, so your hair stays in perfecy style whatever the weather. Easily brushed out, it gives off a luminous, reflective shine without weighing your hair down, as well as fighting frizz and humidity. Hold Moroccanoil Luminous Hairspray can 10 inches from hair and spray. For extra volume, spray on roots before styling. Or for a fuller, texturised effect, use Moroccanoil Root Boost. Glycerin: Natural humectant; provides hair moisturising benefits.